The WF_USERS view contains information about every user who can receive notifications and responses in Oracle Workflow. The below table shows all of the columns in the WF_USERS view. the Workflow Engine will refer to for the user name. the original system where the user resides. inactive users, and TMPLEAVE for temporary leave. The WF_ROLES view contains information about every role in Oracle Workflow that can receive notifications and responses. Each user in WF_USERS must be a role in WF_ROLES. If the attributes of the role are different than the attributes of the users within the role, the attributes of the role will override the attributes of the user. The below table shows all of the columns in WF_ROLES. the Workflow Engine will refer to for the role name. The display name of the role. to expand the role into its users. The fax number of the role. the original system where the role resides. 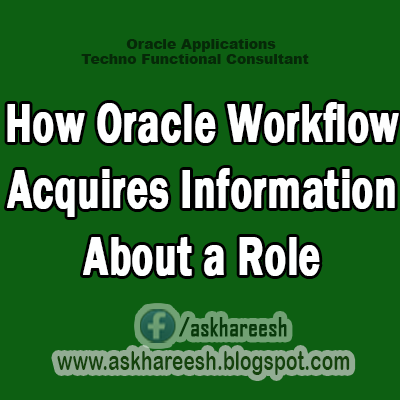 In Oracle Workflow, WF_USER_ROLES is the view that resolves the many-to-many relationship between users and roles. One role can contain many users, and one user can belong to many roles. The below table shows all of the columns in the WF_USER_ROLES view. The internal name of the user. and User_orig_sytem_ID to join to WF_USERS. User_orig_system to join to WF_USERS. The internal name of the role. the ROLE_ORIG_SYSTEM_ID to join to WF_ROLES. ROLE_ORIG_SYSTEM_ID to join to WF_ROLES.